Previously, the Federal Energy Regulatory Commission (FERC) regulated wholesale energy markets and transmission within interstate commerce by certain categories: (1) generators, (2) transmitters, and (3) distributers; all of which operate under different rules of sale and rates. The characteristics of each category include the ability to inject electricity into the grid or withdraw electricity (i.e. be charged by electricity) from the grid. But energy storage does not fit squarely into those categories, as its technologies can inject and withdraw electricity, which exceeds the “siloed regulatory framework” pertaining to wholesale power sales and conveyance in interstate commerce. As common sense would dictate, a framework that does not address a particular topic will, undoubtedly, provide an insufficient definition, which was precisely the case for energy storage. In the past couple years, this inadequacy has been addressed through suggested amendments that permitted energy service to be sold in wholesale markets and transmissions systems, which are operated by regional transmission organizations (“RTOs”) and independent system operators (“ISOs”). Essentially, those proposals were adopted in the final rule announced February 28, 2018, as a means of implementing flexible and effective implementation of energy storage technologies. The Order creates a definition for “electric storage resource” defining it as: anything that can receive electricity, “stores” it, and returns it to the grid. It does not provide specific types of energy storage. Though energy storage has been released into the wholesale market, the RTOs and ISOs are subject to the FERC’s jurisdiction, and thus the Order provides criteria each RTO and ISO must meet. 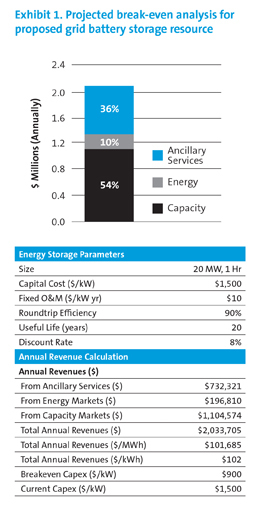 The requirements demand the RTOs’ and ISOs’ rules ensure that: energy storage valuation is based on technical merits, storage can go up and down, battery characteristics are taken into account, and clarity regarding “whether behind-the-meter assets can buy wholesale and ‘sell’ in the form of reduced retail consumption, or other such market maladjustments that could occur in mixed situations like these.” Though the rule will take effect 90 days post publication, RTOs and ISOs will have about 9 months to submit compliance filings and an additional year to employ the imposed requirements into their respective models for all types of electric storage resources, without any instruction from the Order on how each RTO and ISO are to implement them. The Order has been interpreted as a clear message from FERC on the indefiniteness of energy storage on the grid and placed it on equal footing with other energy resources. As a result, other energy resources and market participants will likely want to promote their interests. For example, fossil fuel generators will seek to preserve itself from total depletion, by determining a limit for reliance by permitting each storage source to periodically inject electricity into the grid; this can be problematic for other grid participants. Conversely, positive predicted outcomes of the Order include the overall valuation of renewables to appreciate and an alert regarding the limit on battery storage, due to the absence of a vital component for U.S. battery manufacturing, cobalt. Therefore, the FERC should create various committees to work with other energy resources on the grid in order to analyze issues, develop preventative strategies to implement this new rule. Those committees should establish pilot studies with a select few RTOs and ISOs by submitting compliance filings early, at the beginning of the 9-month window and immediately implementing the requirements, and waive transaction costs associated with this trial and error period. This way, it can allow the FERC to observe actual impacts prior to the required employment of the Order’s criterion on all RTOs and ISOs and therefore maximizing the effects of the Order. Sullivan & Worcester, FERC Energy Storage Rule Creates New Opportunities for Small, Low-Impact Hydropower Projects, (March 1, 2018), https://www.jdsupra.com/legalnews/ferc-energy-storage-rule-creates-new-61742/. Caileen Kateri Gamache, Deanne Borrow, Ken Collison, & Shankar Chandramowli, Taking on Storage Part One: Understanding the Drivers, (January 11, 2018), http://www.renewableenergyworld.com/articles/2018/01/taking-on-storage-part-one-understanding-the-drivers.html. Sullivan & Worcester, supra note i.
 Sullivan & Worcester, supra note i; Keith Goldberg, FERC Energy Storage Rule Is A Grid Game-Changer, Law360 (February 16, 2018, 9:24 PM), https://www-law360-com.ezproxy.law.uky.edu/articles/1013613/ferc-energy-storage-rule-is-a-grid-game-changer. FERC, Electric Storage Participation in Markets Operated by Regional Transmission Organizations and Independent System Operators, 18 C.F.R. § 35.28(b)(9) (2018) (https://www.ferc.gov/whats-new/comm-meet/2018/021518/E-1.pdf). E-mail from Karen Greenwell, Prof., Univ. of Ky. Coll. Of Law, to Melanie J. Ramsey, Staffer, Ky. Journal of Equine, Agric. & Nat. Res. Law (March 9, 2018, 11:16 EST) (on file with author). ; see 16 CFR 35.28(b)(9). See 18 C.F.R. § 35.28(g)(9) (2018). Jeff St. John, FERC Allows Energy Storage to Play in Nationwide Wholesale Mkt., (February 15, 2018), https://www.greentechmedia.com/articles/read/ferc-energy-storage-wholesale-markets#gs.fFpQsfM. Levi McAllister, Stephen Spina, & Arjun Prasad Ramadevanahalli, How FERC's New Rule Paves the Way for Energy Storage, (February 22, 2018), https://www-law360-com.ezproxy.law.uky.edu/articles/1014891/how-ferc-s-new-rule-paves-the-way-for-energy-storage. E-mail from Karen Greenwell, Prof., Univ. of Ky. Coll. Of Law, to Melanie J. Ramsey, Staffer, Ky. Journal of Equine, Agric. & Nat. Res. Law (March 9, 2018, 11:16 EST) (on file with author).